When hot, swirl in the oil. Add in the eggs and scramble for 15 seconds. Once the eggs have just set, remove the eggs to a clean plate or bowl. Return wok to stove and turn to medium-high heat. Add in the diced ham and cook for 2 minutes until warmed through and browned. Push the ham to one side of the wok to leave room to fry the next ingredients. Add a bit of cooking oil if necessary. Add in the green onion, ginger and garlic, stir fry for 30 seconds until fragrant. 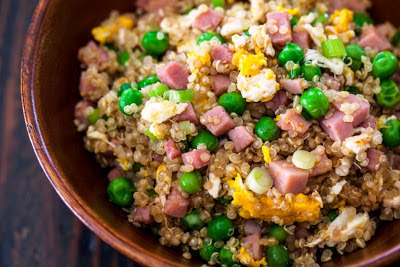 Mix in with the ham. 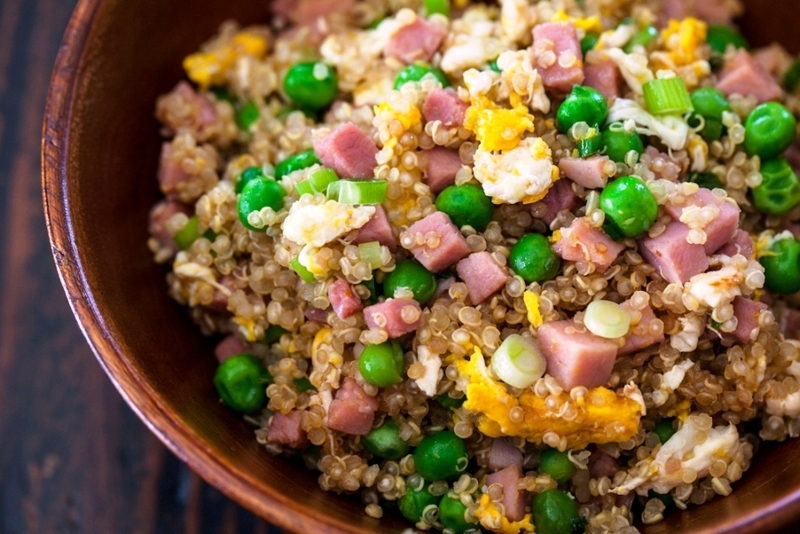 Add in the cooked eggs, frozen peas and quinoa. Toss and stir fry for 2 minutes, spreading everything out over the surface of the wok. Pour in the soy sauce, fish sauce and add in the black pepper. Toss again and stir fry for an additional minute.